The walls of Fleur de Sel are decorated with Cyril Renaud's art. This is of interest because the plates at Fleur de Sel are also decorated with his art: Cyril is the chef. Both the art on the plate and on the walls have a couple of things in common. Both are the work of an obvious talent, both are decidedly French, both have a humility, and both are part of a fine aesthetic. The place their similarities happily end is that you can smell, taste, feel, hear and ingest the stuff on the plate. People constantly say things like, "I wish there was a little place close to the neighborhood that wasn't so hyped that you could just go on any given night and have an expertly prepared meal in a quiet room without jumping through all the hoops you have to to get a dependably great meal in this town." Then they take a deep breath. Fleur de Sel is the kind of place that makes me sure that (myself included) all the dedicated food geeks I know are mostly liars. Fleur de Sel is a demure restaurant on West 20th street that continually puts out dependably wonderful and exact French food. The other trick Fleur de Sel does is that it lives comfortably on everybody that has been there's list of great places without ever being a spot with crazy buzz. The only two times I gush about Fleur de Sel are lunch (when a tasting menu is only $25.00) and Monday nights. Having recently gone to a Vega Sicilia tasting in which the wines showed decidedly poorly, it seemed a great time to give the label a second shot. In general Fleur de Sel's wine list is quite good - although not offering great deals, the wines are priced in line with the market it inhabits. It is French focused, with a good selection of the world's offerings. On Monday nights a chosen wine region is discounted by 50%. For the month of May the section of the wine list on sale is Italy and Spain. So it makes sense, although I would happily eat at Fleur de Sel any night of the week, to stop in on a Monday, especially if you are going to be in the company of folks like me, Pichon, Ringwald, Deputy, Ducky and Wife. 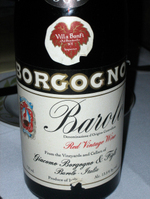 Barolo, Giacomo Borgogno Piedmonte, Italy 1964 this is one of those wines that will convince you that "modern Barolo" is a huge waste of land and juice. Classic Barolo, afforded the time to become all it can be, is a fantastic thing. Fresh from the bottle this had the forward fruits of a young wine. As it opened it deepened into the deep chocolates of coco powder, stopping at plums and roses along the way. Girls: Alaskan Smoked Salmon, Lemon Crême, Mango a thinly sliced circle of mango with a ball of lemon cream on top, and smoked Alaskan salmon wrapped around the ball. Topped with some salmon roe it played sides of the middle of the flavor spectrum - the lemon and roe offering slight bitterness against the slight sweetness of the fruit and light richness of the cream. Boys: English Pea Soup, Tomato Sorbet, Mint bright green, sweet and earthy. The sorbet was sweet and acidic playing off the minor chlorophyll bite of the young peas. Hiding in the bottom of the bowl were preserved strips of tomato meat that had a smoky aged vinegar acidity, adding another layer to this simple soup. 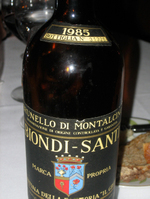 Brunello di Montalcino, Biondi-Santi Tuscany, Italy 1985 showed enough iron and Madeira on the nose to make me suspect this was not a perfect bottle, but also showed enough cherries, leather, and flowers to keep my interest. Girls: Duck Prosciutto Galette, Lentils, Aged Balsamic Vinegar perfectly vinegary, slightly metallic lentils between wafer disks, topped with ultra thin slices of cured duck breast. Again, opposite sides of a narrow field - gamey and rich vs. metallic and vinegary - with the thinnest of wafers contributing crispness. Boys: Suckling Pig & Foie Gras Terrine, Pickled Breakfast Radish this course played a similar game of fatty against vinegar-y but further in both directions. The paté was rich and meaty (and of course foie-y) and the pickled radishes brought the higher zing of pickling vinegar, while a drizzle of balsamic grounded it a little. Girls: Maine Sea Scallops, Potato Saffron Purée, Bouillabaisse Foam a large scallop, seared golden, served with a ramp and potato puree, poached fiddlehead ferns and saffron foam. I know that's not how it reads, but that's how it tasted. The scallop was light and sweet, the fiddleheads were green and devoid of their usual bitterness, the potato purée was as green as the fiddlehead, tasting lightly of green garlic and onion. All this was awash in foam that tasted of crustaceans and saffron, playing perfectly to the scallop. Boys: Almond Flour Crusted Soft Shell Crab, Meunière, White Asparagus on top of morels with a white wine lemon brown butter that played the lemon and salt side a little heavily when the mushrooms weren't included in the bite. 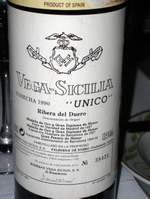 Ribera del Duero, Vega Sicilia 'Unico' Reserve Castilla-León, Spain 1990 quite a showing on its second chance, definitely still a version of great Bordeaux but with an individual character. Primarily wood on the nose, there were jammy overripe black cherries and sweet tannins on the palate, and a line of acid driving right though the center. Girls: Moroccan Black Olive Crusted Hake, Tomato Confit, Fennel, Pea Emulsion the flaky white fish combined with the olives to create a marginally chlorinated flavor in a pool of sweet peas, with fiddleheads rounding out the springy mélange. Boys: Halibut, Glazed Endive, Oklahoma Pecans, Bacon, Balsamic Reduction the halibut was cooked to a very dense chew. Its accoutrement, a blending of the salty, smoky, bitter and acidic components, resulted in the fish playing more a textural role than a flavor one. Welschrielsing, Alois Kracher TBA #01 Zwischen Den Seen Neusiedlersee, Austria 1995 I suspect you already know foie was the next course because of this wine choice. This had all the fresh lemony acids, deep bruléed sugar and dried apricots to make it dance nicely with the richness of the seared liver. Boys and Girls: Seared Hudson Valley Foie Gras, Provence Rose Water, Dried Fruit Purée fruit is often paired with foie in one way or another. What sets this dish apart in that world is the flavor of roses. Seriously inspired. The other places I have loved rose are with fattier things like pork shank. This dish is one of those smack-your-head-how-did-it- take-this-long-to-get-to-this moments. 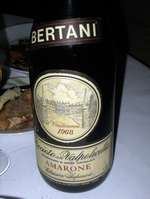 Amarone, Bertani 'Della Valpolicella' Veneto, Italy 1968 pleasingly much drier than expected, with raisins, minerals, notes of cedar, and chocolate. At thirty-eight years this wine tasted young. Girls: Roasted Sullivan County Squab, Green Asparagus, Ramps, Black Truffle Sauce a sanguine gaminess tied to flavors evoking bud break on the forest floor with the earthy truffles and the young greenness of asparagus and ramps in spring. . Boys: Braised Veal Breast, Celery Root & Black Truffle Purée, Beurre Noisette Sauce almost a textbook example of why to braise, the veal breast ranged from crisp and fibrous to dense and meaty, passing through a rich fat layer, with a pureed celery root contributing to the creamy lavishness of these deep flavors. Girls: Colorado Rack of Lamb, Fresh Herbs, Baby Spring Vegetables the crust on this chop stood in stark contrast to its rareness. Soft, tender and rich throughout, there was a crisp black crust with exactly the right touch of salt, pepper, and the flavors I associate with herbes de Provence. Boys: Venison Loin au Poivre, Watercress, Peruvian Potatoes, Gin & Sage Sauce roasted slowly, the loin was at the far end of tenderness, beautifully balancing the juniper and botanical flavors of the gin with sage and the piquant bite of black pepper. With both the pepper here and the olives on the Hake a dry ingredient has been so evenly applied to a protein it seems as if it may have been a liquid at some point. Boys and Girls: Artisanal American Cheeses, Toasted Walnut Bread a very acidic blue, a very astringent firm-curd cow, and a sheep-goat separated by a vegetable ash line, perfect for cleaning up the wines that remained in the glasses. Girls: Duo of Gaufrette au Chocolat & Chocolate Tart I didn't really taste it but every one seemed happy. Boys: Duo of Vanilla Panna Cotta & Banana Mousse I didn't really taste it but every one seemed happy. Boys and Girls: Granny Smith Apple Brittany Crêpe buttery and light with not much more sugar than the apples naturally brought to the party, this was an exceptional end to the meal. Fleur de Sel is a great little restaurant on a diminutive block in the shadow of the Flatiron building. Perfect if what you want to do is concentrate on your company and enjoy seriously good French food. Don't go because you want to see or be seen, go because the food has presence without assertion.